← When do we intervene? HRV fluctuates to a certain extent on a daily basis. I’ve seen athletes with coefficient of variations (CV, a marker of deviation from the weekly mean) as low as 2% to >15%. An athlete’s CV changes over time, which itself serves as what I believe to be, an important indication of training adaptation. The CV is related to individual fitness level and training stress and possibly even performance potential. Measurement position will also affect the CV with lower CV’s observed in the supine position compared to standing. Here’s an important lesson I’ve learned about interpreting HRV in athletes. A daily change in HRV can occur for a number of reasons, and may or may not have any meaningful impact on acute performance or “readiness”. Putting too much focus on an acute change in HRV without stepping back and observing the overall trend is a bit myopic. This isn’t to say that daily changes aren’t useful, just that a full appreciation of the training process, including the evolution of the trend in response to training will enable better analysis and therefore decision-making. This is because longitudinal changes in an athlete’s HRV trend do not occur for no reason. Increases, decreases, greater fluctuation, less fluctuation, when assessed over time, are all very meaningful. Observe the screenshot below which details the last 6 months of a high level collegiate sprint-swimmers trend. 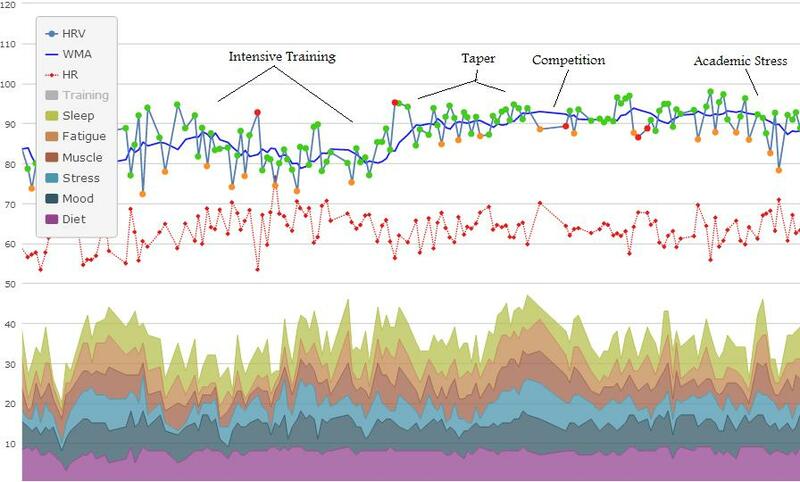 The data pretty much interprets itself when you compare the changes in the trend to changes in training and life events. What can we observe from this? Greater fluctuation and a decreasing trend during normal training with increased academic stress (preparing for and writing exams). Thanks to recent work from Bryan Mann, we know that this increase in non-training related stress may put athletes at greater risk of injury or illness. I strongly believe that to use HRV effectively, you need to consider the changes in the trend, and not just the day to day stuff. When asked what HRV products are worthwhile or what do I think of App X or product Z, I always suggest that they invest in one that provides the best visualization of the data over time and includes other markers of training status (i.e., load, wellness, etc.). This enables more meaningful interpretation of the data and can therefore be more insightful and useful when determining the appropriate action to take with regards to training program adjustment. This entry was posted in Heart Rate Variability, Monitoring and tagged adaptation, assessing, athlete monitoring, heart rate variability, HRV. Bookmark the permalink.